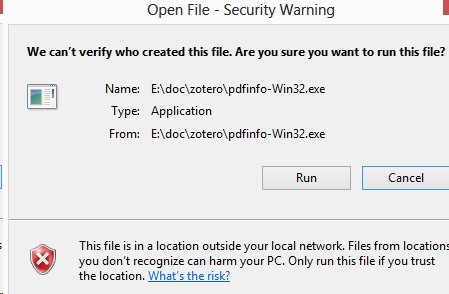 … by running gpedit.msc as admin and setting "user configuration / administrative templates / windows components/ attachment manager / "Do not preserve zone information in file attachments" to "Enabled No. " I observed these files in the drive my virtualbox win 8.shares with the linux host. The answer is out there , of course, just not with all the search terms. A more thorough security discussion is also available. Where the Zotero address bar shows you, instead of a (blue) book or (black-and-white) manuscript icon (= journal article) a yellow Manila folder, you can download a batch of references at once. Zotero needs to have a “translator” (see the full, automatically generated list of all Zotero translator) for this site. YMMV: Not all Wikipedia articles are marked up with machine-readable metadata (but I assume more and more, even though there is also FUD over shifting standards like microformats, microdata). Google Scholar: Where authors provide their actual articles, Zotero shines even more: Here the Zotero translator is able to download also any (well, most!) attached PDF’s.